With the advent of modern medicine in the 19th and 20th centuries, midwives faced near extinction in North America, but have re-emerged to carry the work of community midwives into the 21st century. At this time when our collective memory of giving birth under our own power is yielding to dependence on medical technology, midwives play an important role in safeguarding the power, dignity, and beauty of natural birth. Simultaneously, midwives look toward the future, conscientiously applying advances in medical science to the practice of midwifery where it benefits the birthing parent and baby. At Birthwise, we blend tradition and modern science in a way that intends to preserve and build on the traditions of family-centered physiological birth practiced by the midwives who came before us. Until the 19th century, midwives attended the majority of births in all parts of the world. These midwives, traditionally chosen by their communities, supported people as they gave birth naturally. These midwives, the first maternity caregivers, grounded their practice in the wisdom and skills passed from one generation to the next, on their first-hand experience giving birth, and on the experiences of the birthing people they attended. Midwives still attend the majority of births worldwide, although this is not the case in the US. That midwives have been relegated to the margins of the maternity care systems in countries like the United States is surprising, considering the numerous studies confirming the benefits of midwifery care. Despite advanced medical technology and medical intervention, US birthing people and babies are more likely to die in childbirth and babies are more likely to be born prematurely or of low birthweight than in other developed countries. Unacceptable disparities in birth outcomes exist between cultural and racial groups in the United States– despite the fact that we currently spend more on healthcare per capita than any other country in the world. We believe midwifery care is the key to improving birth outcomes, especially for the most marginalized and vulnerable populations. As an institution, Birthwise is actively engaged in efforts to improve birth culture in the United States by establishing a more central role for midwives of all types. In particular, we advocate for the integration of Certified Professional Midwives (CPMs) into the wider system of maternity care for the benefit of birthing people and babies. We want to be part of the solution by graduating skilled and compassionate midwives that will serve diverse communities. Birthwise Midwifery School is also dedicated to the development of midwifery scholarship. We publish Midwifery Matters, a bi-annual academic journal that showcases exceptional and relevant midwifery research, particularly research conducted by our own students, faculty, and alumni. Pregnancy and birth are natural processes that work best when undisturbed. Normal healthy pregnant people often do not benefit from, and can be hindered by, routine medical intervention. Birth has spiritual, aesthetic, and personal significance for birthing parents and their families. Midwives should be available as primary caregivers to all pregnant people and their infants. 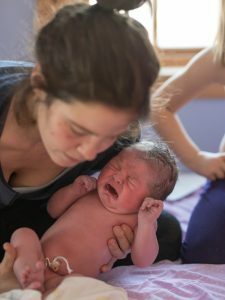 Giving birth at home or in a freestanding birth center are viable and safe options that should be available to people today and in the future. A person’s right to choose and have decision-making power in their care, to receive continuous care from known providers, and to share in the responsibility for their care are cornerstone concepts for midwives. This model of care encourages a relationship of empowerment and collaboration between the client and the midwife. Every individual and family has diverse desires and needs when it comes to childbirth. At Birthwise we aim to train midwives that appreciate, accommodate and reflect this diversity. Our faculty and alumni represent a spectrum of approaches to midwifery care and, in the Birthwise curriculum, these varied approaches are treated with equal respect and attention. Midwifery is a positive force in both human ecology and global politics. As holistic, natural childbirth, midwifery preserves a primordial cultural tradition. In the strengthening of family units and birthing parents in particular, the respect for the natural birth process, the holistic approach to care, and the cost-effectiveness of midwifery care, we see midwives as being a key ingredient in creating a sustainable world.